For a junior genealogist like myself, who enjoys prying into the previous lives of my ancestors, discovering a new name to add to my family’s growing tree is a feeling like no other. It gives an identity to those previously unknown. A researcher is doubly blessed if they are lucky enough to posses actual photographs of their ancestors and can add a face to a name. Such photographs also document the history of early photography and add an extra layer to the family story. For me peering into the eyes of an ancestor adds an even bigger excitement and vintage photographs are genuine gifts. Last year I attended a lecture given by photo detective Maureen Taylor. I find it amazing that if you know what you are looking for a picture surely does speak a thousand words, but for me it is not always easy to hear them! Picking up visual cues in old photo’s is a welcomed challenge for me. I am lucky enough to have some vintage family photographs from my mother’s side of the family, but I am also unlucky to have so many unidentified photographs that remain “nameless” Many of the photo’s were marked in ink but the author referred to them as “sons and daughters of” only deepening the mystery of these lost family members and friends. I thought I would share some of these faces with you today, in the hopes that my fellow photograph detective’s might be able to catch some clues. This is a photograph of my 3rd cousin (daughter of my great grandmother’s brother) I love the flapper style of clothing which would date the photograph to about the 1920’s. If I knew enough about cars, I could probably learn a lot about the photo from the car parked in the background. I am of course intrigued by the tropical looking trees. 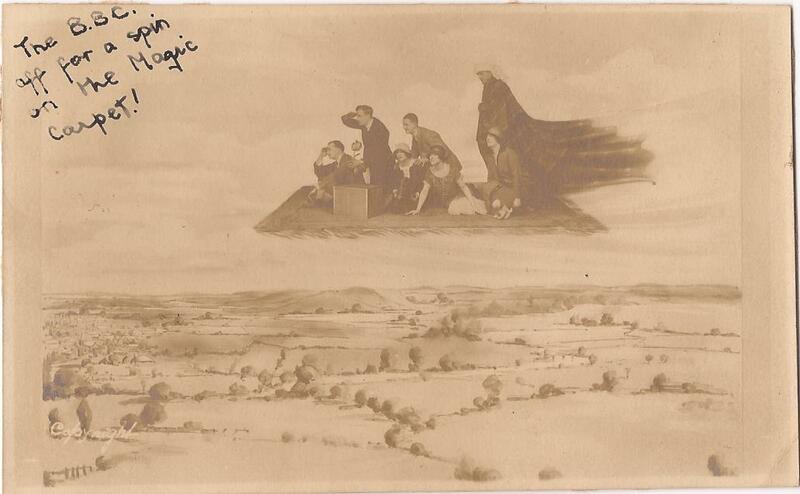 This family was from England, but this photograph may have been taken on a holiday. My Great,Great Uncle John Plummer ( pictured above center) is the father of the My unknown 3rd cousin. 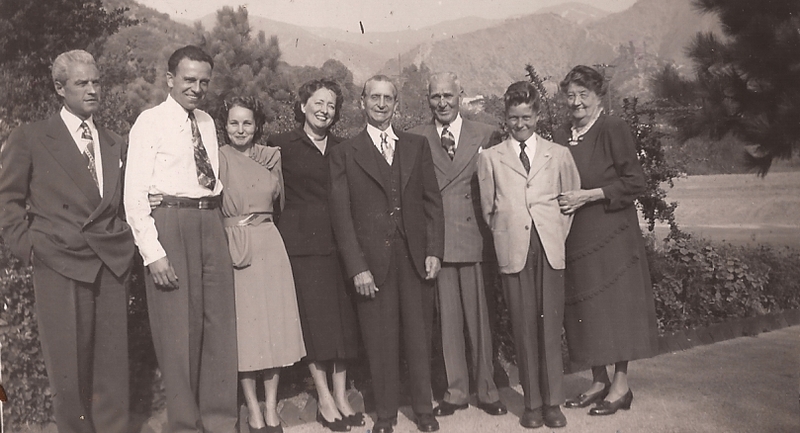 This photograph was simply marked “brother John family and friends.” The mountains in the background offer beauty, but not many clues as to location. 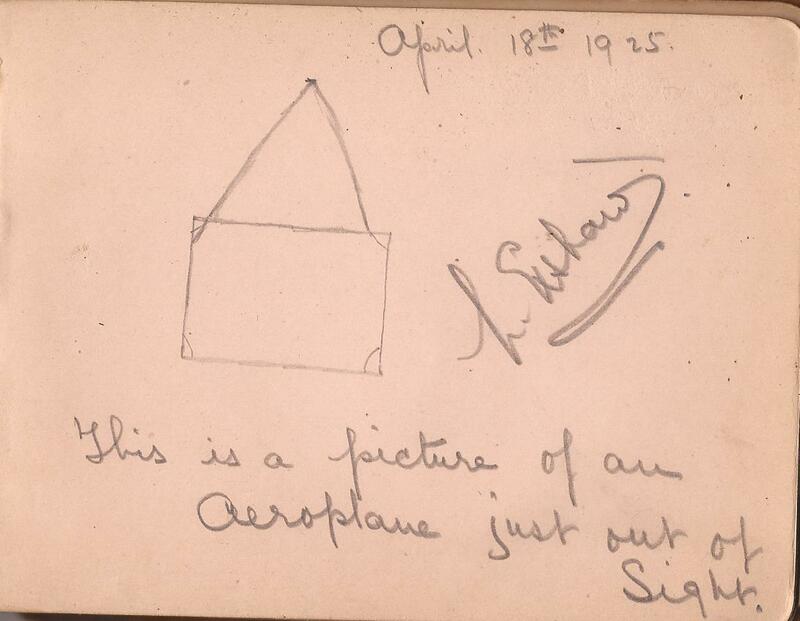 Finally, this photograph was found with the same book of photo’s. This appears much younger than the rest and is one of few color photographs in the album. “The Mad Men” clothing style and home interior give this photograph an early 60’s feel. After that, this photo and all those in it are a complete mystery, and I will be honest, I didn’t notice the dog….until now. 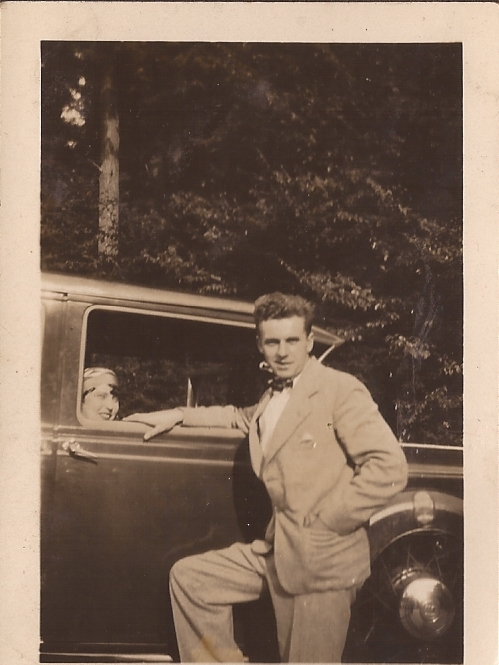 Do you have any mysterious family photographs? 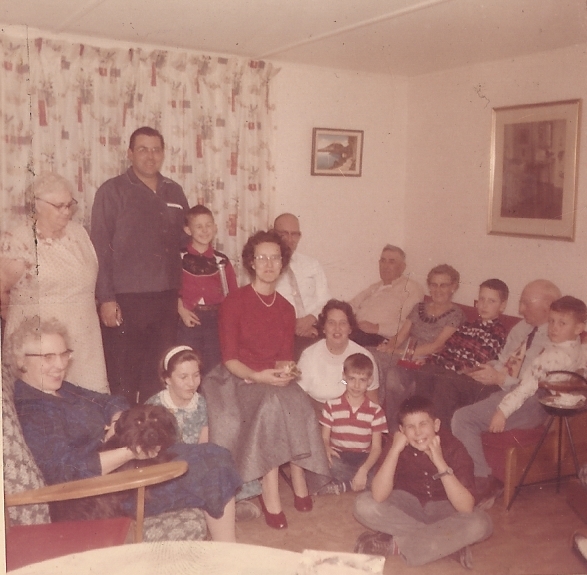 Do you find photographs to be an exciting tool for genealogists? I would love to hear from you! It has been slim pickings lately on the upcycle front. It seems everyone (myself included) is battling the impact felt from mother nature. Thrift store stock is limited and picked through, and the curb sides are piled with (you guessed it…snow) Thank goodness I have yard sale season to look forward too as it is only about a month or two away. To remain occupied, I now look around the house and get ideas on how to improve on things we already have. One such item is my husband’s side table, which adorned his childhood home. I have wanted to work on this piece for a very long time. This table has seen better days, and I am in the process of hand sanding it, a messy and sometimes slow process. Working on it made me think of treasuring and preserving those family heirlooms, even if they are worth no more than sentimental value. For me, the more sentimental, the better. 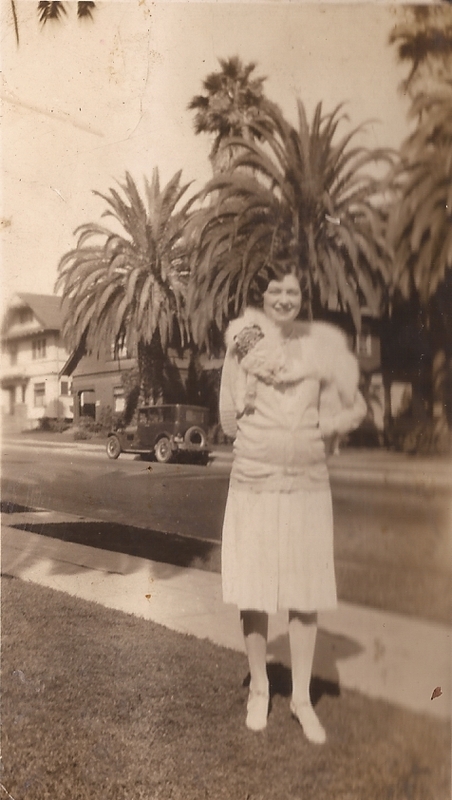 Recently, I have been scanning and uploading old family photographs, and trying to unlock their mysteries. It has been a while since I have blogged about family history and genealogy but don’t let my inactivity on the subject fool you. Sure, I take a rest from it from time to time, sleep on it, put it away, but it is always pulled back out, and revisited. 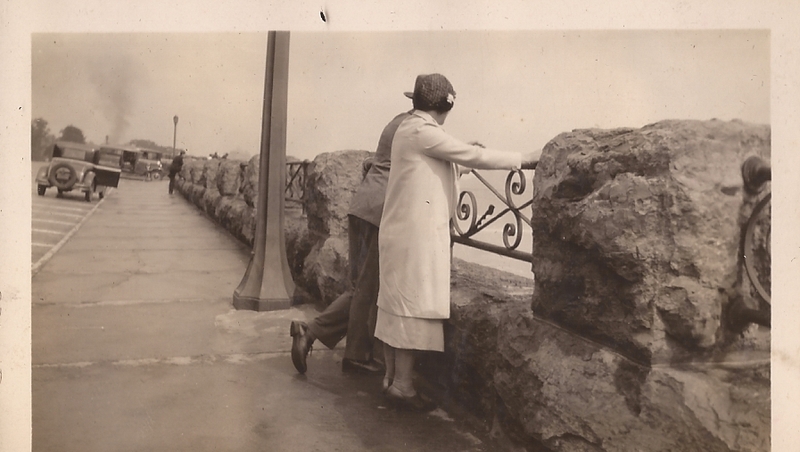 I came across this wonderful photograph of my Great Grandfather Harry Long with my Great Grandmother Daisy (Plummer) Long at Niagara Falls NY. Many things do change with time, but natural beauty can last for generations. Millions of people have passed through New York or Canada to see the wonders of Niagara Falls. They pose with their loved ones in front of its massive beauty. It reminds me that although the years become an obstacle keeping us from knowing our beloved ancestors, the experiences and places that remain allow us to walk in their footsteps. What is left behind allows those who have passed away to have a “voice” This I believe brings us closer together. Different time, but we are not so different. I think this photograph proves that. Just an ordinary married couple leaning into the mist as so many others have done before and after them. 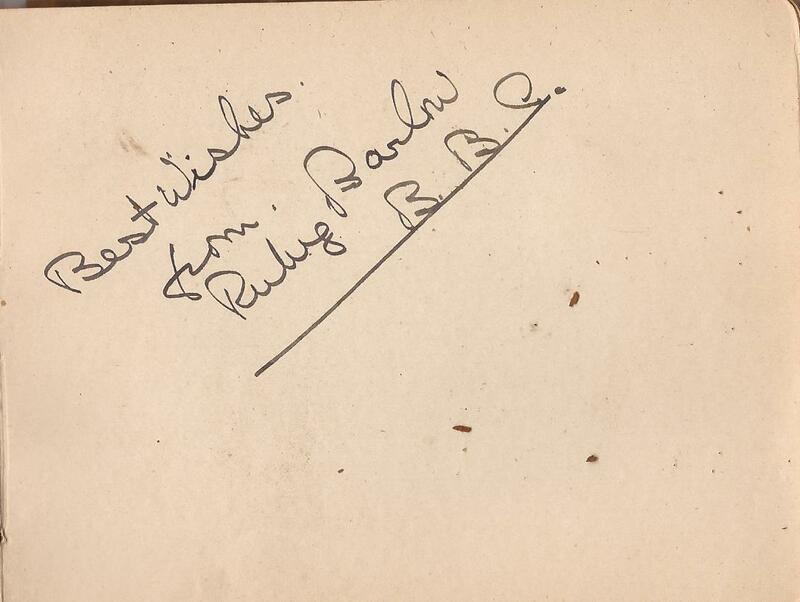 I remember as a child visiting my grandfather’s house and looking through the little brown autograph book that belonged to his sister, my Great Aunt Eva Long. It always fascinated me even then, but as a child I never asked questions and my beloved Grandfather Vincent Long passed away in 1985 when I was only ten years-old. For years, my sister held on to the book and other documents after my grandfather passed away, until I became interested in Genealogy in 2009 and asked if I could revisit these items again. With the existence of the internet and the ability to reach out to others and research online it seemed possible now more than ever that I might be able to unlock the mysteries of that little brown autograph book, one story at a time. I wanted to learn more so I brought this document to the “Genealogy Roadshow” at this year’s Mid Atlantic Genealogy Conference. I wanted to get some advice as I had tried researching this before and came up with very little information. This past week I had a huge break through when the BBC finally contacted me and is interested to know more about some of the historical items I have. 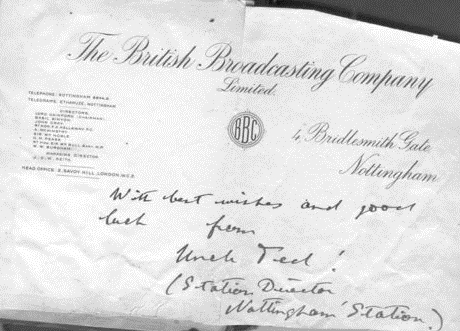 The person at the BBC asked me via e-mail if the Ted I was referring to was Edward George Downing Liveing,who went on to have a distinguished career with the BBC, and served as Nottingham’s station director at that time. Now, I had a name to go on, and typed it into a search engine. I found an amazing site dedicated to Edward’s family line called The King’s Candlesticks. I contacted the webmaster via e-mail and attached a copy of the document for his review. I was so happy to receive an e-mail back, confirming once and for all that “Uncle Ted” was indeed, Edward George Downing Liveing. 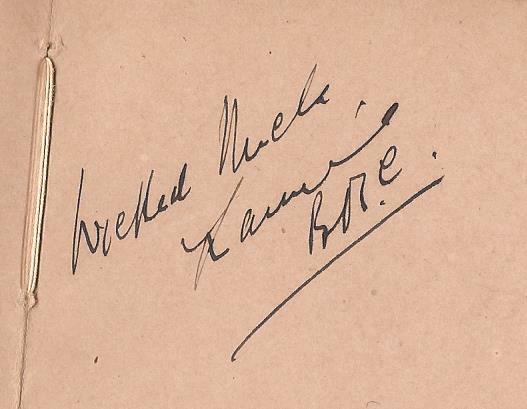 He attached handwritten letters written by Edward George Downing Liveing in which he referred to himself as Ted (a nickname for Edward) and the handwriting was a match. Finally, the mystery of Uncle Ted had been solved, and I have the kindness of strangers to thank! The internet certainly is a Genealogist’s best friend! Recently, I took a trip to Staten Island, NY to visit some relatives and stopped by St. Peter’s cemetery where my ancestors and family members are buried. It is a large Catholic cemetery not far from Silver Lake Park and located directly across the street from The Staten island Zoo. My Grandparents, Great Grandparents and Great Uncles are buried there. My Maternal Grandmother’s parents and brothers rest together in this cemetery. I visited each ancestor, and left a small, handmade floral to pay my respects to each of them. I would like to focus now on my Grandmother’s brothers. My grandmother was the only girl in a family of five very larger than life brothers (seven if only two brothers had survived to adulthood.) Today, I honor three of my great uncles: William, Joseph, and Edward. 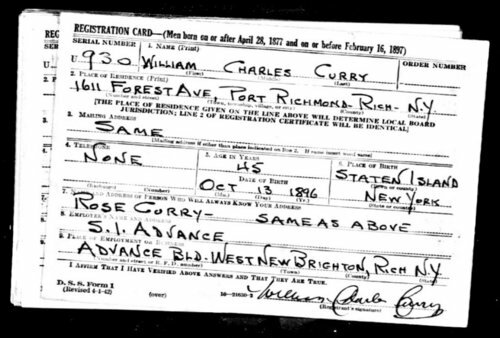 William Charles Curry born October 13, 1896 “Uncle Willie”was the oldest child of Charles Curry and Julia O’Reilly. As a young man he worked for a company called Gillespie Brothers 11 Broadway, NY, NY According to his WWI Draft Card Record. His Eyes were brown and his hair was black. According to family lore he was a talented amateur boxer. He worked for years for the Staten Island Advance a local newspaper in Richmond County New York. He married Rose Zinicola born in 1909 and together they had three children, Mary, Joseph and Margaret. William passed away in 1985 at the age of 89.
born November 29, 1905 was a decorated World War II veteran. He was a radio operator for 20 years for the Exxon Corporation. He worked on tankers and traveled the world. 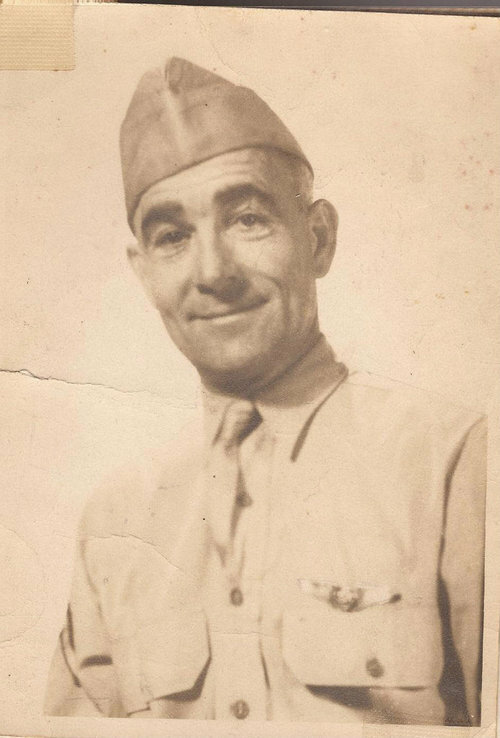 He was a technical sergeant for the Air Corps from 1942-1945. He received two distinguished flying crosses and two Air Medals for his service during World War II. He never married, and in 1982 passed away after a six-day illness. He was 77 years-old. Joseph is buried with his brother Edward. 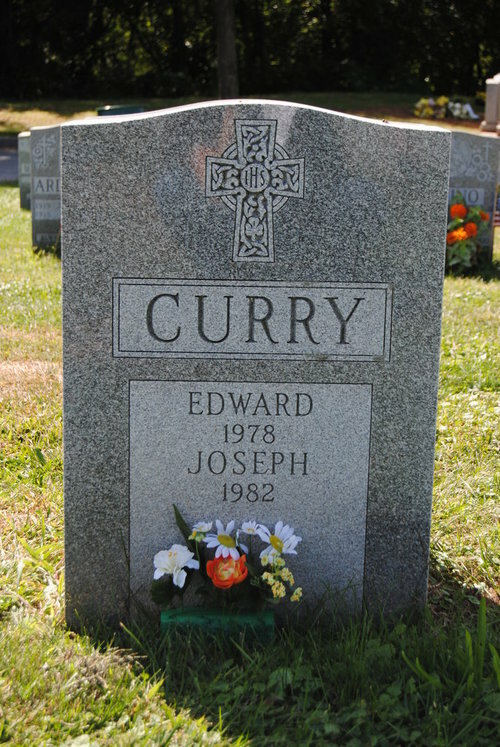 Edward Joseph Curry “Uncle Pie” was born June 18, 1899. Family lore says he gained his nickname for winning a pie eating contest. My great-uncle was a larger than life character known for his sense of humor and personality. He worked as a dock hand for Viking Company in 1920, and Lived at 103 Monroe Avenue Tompkinsville, (Staten Island, NY) He was described on his draft card as medium height and build with blue eyes and brown hair. He is rumored to have had a child, but he and the women never married. 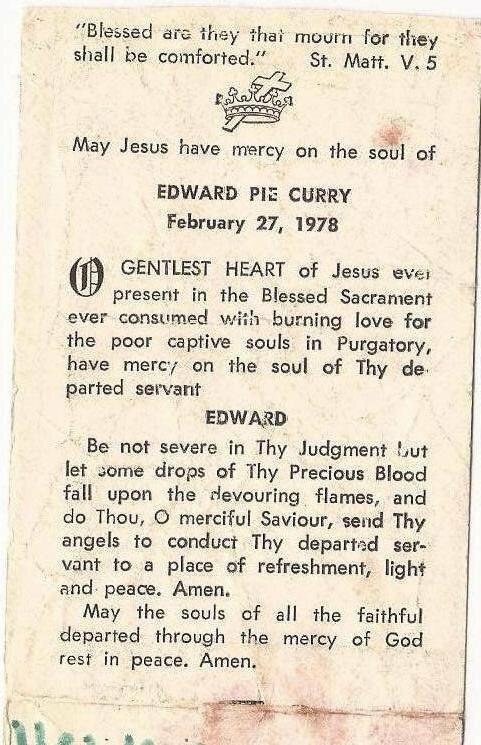 Edward passed away in 1978 at the age of 79. 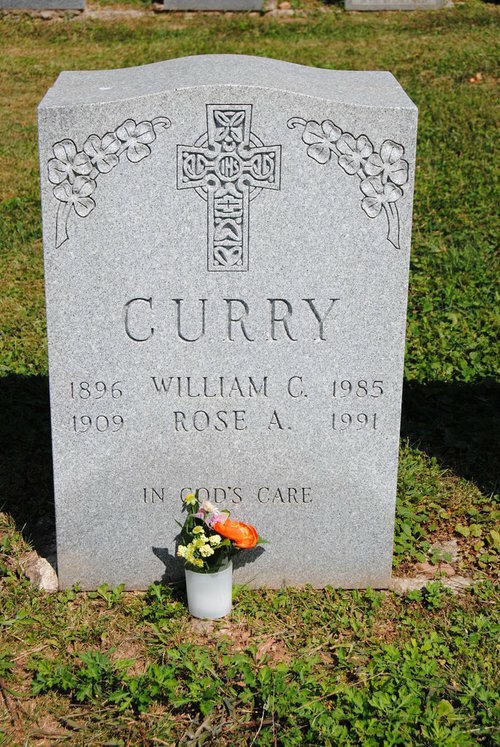 Thanks for reading about my maternal New York born Irish ancestors with the surname Curry, More on the Curry’s to come! Also looking forward to the Mid Atlantic Genealogy Conference coming up this weekend! Hope to learn a lot at my first ever genealogy conference! The Genealogy Series: Murder in a small town, and the man who cracked the case. Margaret “Maggie” Sullivan, was born in 1890, in Moorestown, NJ (Formally Chester Township, NJ) to Irish Immigrant parents Patrick F. Sullivan and Ellen L. Larkin. (She is the sister of William Sullivan who is my husband’s grandfather, and daughter’s Great-Grandfather.) On November 26th 1912, Margaret married John H. Bradshaw in Moorestown, NJ. They began raising a family and had two children. Sometime after 1917, John Bradshaw became a Moorestown Police Officer, and later would become chief of police of the town. Moorestown, NJ is a quiet New Jersey suburb of Philadelphia. The town was founded in 1686 when John Rodman bought a few hundred acres of land. The town having originally been named “Village of Rodmantown.” and for many years after that was known as Chester Township. The town consisted of mostly farm land, and later many residents found work on the railroad that cut-through the town. I never expected when researching the Bradshaw Family, that I would come across such very high-profile murder cases John Bradshaw was involved in solving. I discovered articles posted online in the archives of the NY Tribune, and Philadelphia Evening Public Ledger, mentioning the details of these cases. Genealogy has opened my eyes to the facts. Many horrible acts we think occur more now, happened back then as well, and with more frequency than even I previously realized. 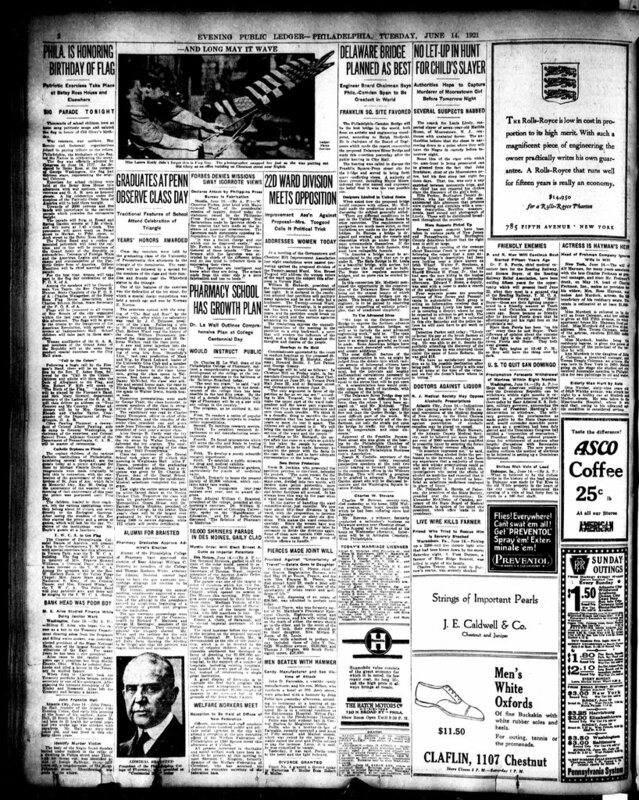 All you have to do is look at any of these old newspaper articles and the stories within the pages. These horrors occurred everywhere and in every time. No town in America was safe from crime as it remains today, and Moorestown was no exception. It became apparent after reading the details of these two high-profile cases Chief Bradshaw was involved in. These cases were the Matilda Russo Murder, and The Quigley Murder He also worked along side the famous detective Ellis Parker. In 1921, Matilda Russo was the seven year-old daughter of town Tailor Frank Russo. Matilda went missing one day. Her body was discovered in the basement of a neighbor’s house, and the accused murderer was on the run with a huge manhunt ensuing. A terrible child murder, the horrible details of which were outlined in the newspapers. Turns out, John Bradshaw helped break the case and discovered the body of this little girl. Because his name was mentioned in the above articles, I was able to discover these stories via search engines. One of the best and probably most under used resources in genealogy are search engines and the best part is they are free! I was able to discover more about John Bradshaw then I had ever expected this way, including online images of some of the actual newspaper articles. According to the 1930 Federal Census, John remained chief of police into the 30’s and remained in Moorestown on Second Street with his wife Maggie and their two adult sons John (Pipefitter) and Edward (mechanic). 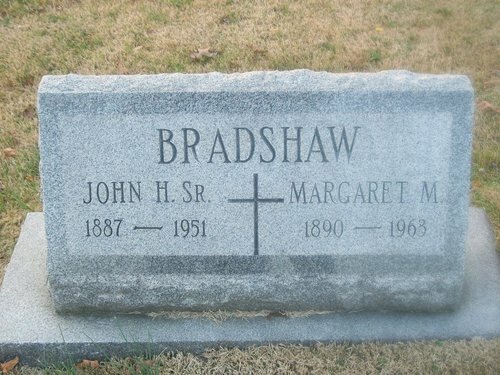 John Bradshaw passed away in 1953, and Margaret Bradshaw passed away 12- years later, in 1963. They are buried in Mt. Carmel Cemetary in Moorestown, NJ. 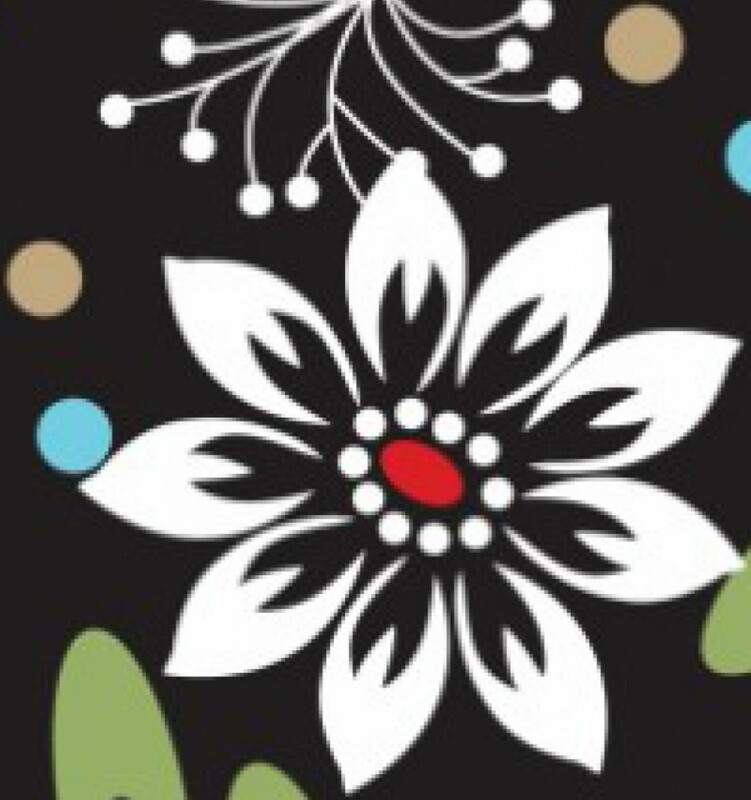 Have you discovered any surprises using search engines? Do you Google your ancestor’s names and info regularly?